I have a long list of lemmings especially makeups and to be more specific a long list of lipstick shades from different high-end brands. Crossing one shade in the list today because I finally got myself a tube of MAC Ruby Woo last year. It's supposed to be a birthday gift to myself but became an impulse buy when I dropped by in MAC Store at Sm Makati. This famous red shade lipstick from MAC has been raved many times by beauty bloggers around the globe and an all-time favorite of famous celebrities here and abroad. 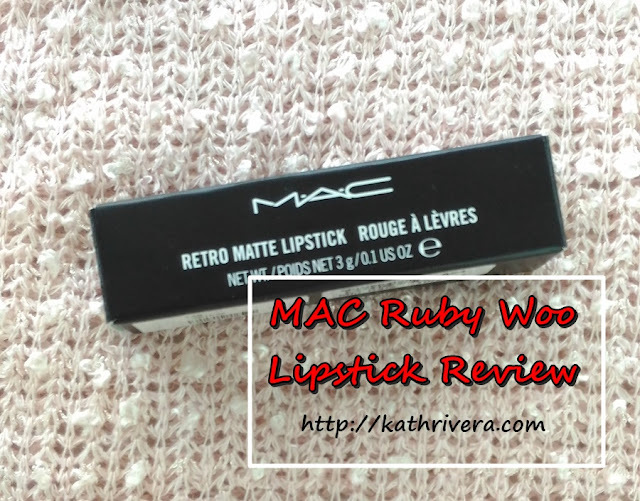 Sharing with you some photos and swatches below and why despite the things I don't like about Mac Ruby Woo, I will still highly recommend this shade to you! 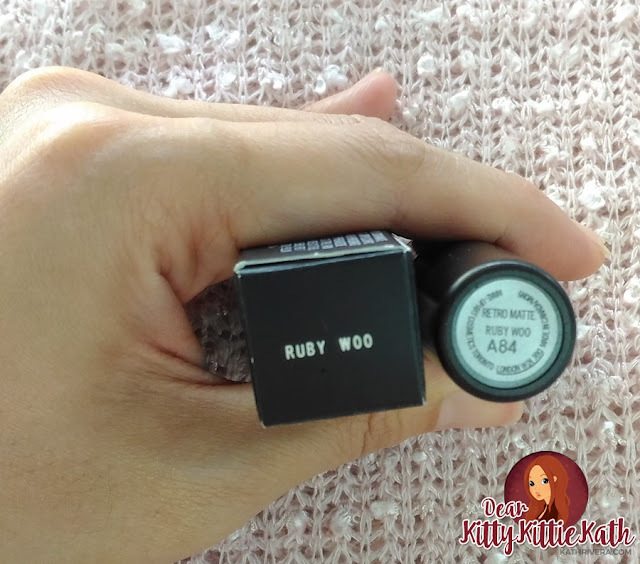 Ruby Woo Lipstick is a deepened, medium-dark red with cool, blue undertones and an ultra-matte finish. It has full color coverage that wears for hours and hours. I agree with her that it is ultra-matte because I have to apply a lip balm first before swiping this lipstick on my lips. I also need to use a lip liner so that I'll be guided in my application. 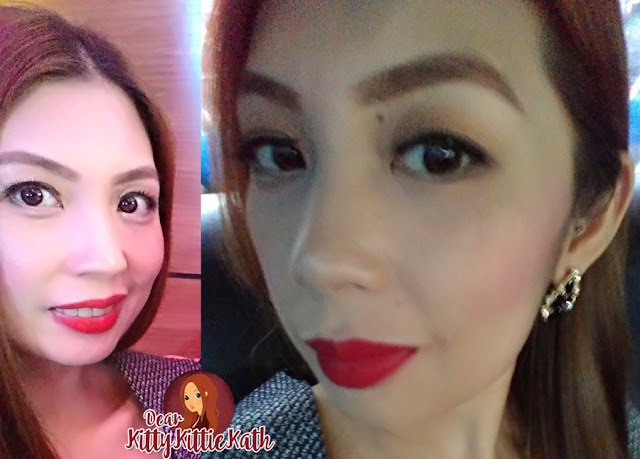 Since it is very pigmented, a mistake will really leave a stain on the outer corners of my lips. On my lips- there's a hint of orange because of the lighting in the hotel lobby. Here are two of the swatches from different lighting. My apologies if the second photo was blurry. I took the photo while inside our moving car. The photo on the left was taken inside the hotel around 8:00 in the evening. The packaging is simple. I have a thing on black bullet lipstick/s so this one is a plus for me. It has a pretty red shade that complements my skin tone. I don't look snob/'mataray' while wearing it. MAC Ruby Woo has a very matte formula and it is really pigmented, goes opaque on my lips with one to two swipes. It's hard to apply at first. I need to warm it up by a swipe or two on my hand before applying on my lips. This will make the application easy and satin-y. Once applied, the texture is velvety. The scent- it is sweet like vanilla but not overpowering. Looks bold red or orange-y red depending on the lighting. It somehow makes my yellowish teeth whiter. The price is steep for budget conscious individuals. The formula is very drying. After 6 hours, it starts to settle on the lines of my lips and I can feel that the skin on my lips is starting to flake. It's always OOS (out of stock) now that Maine Mendoza aka Yaya Dub told her fans the brand of red lipstick she's wearing in Eat Bulaga and yes it's MAC Ruby Woo. Will I repurchase: Yes, if I run out but No for now as I think I'll be having this bullet for a long time because I rarely use it. 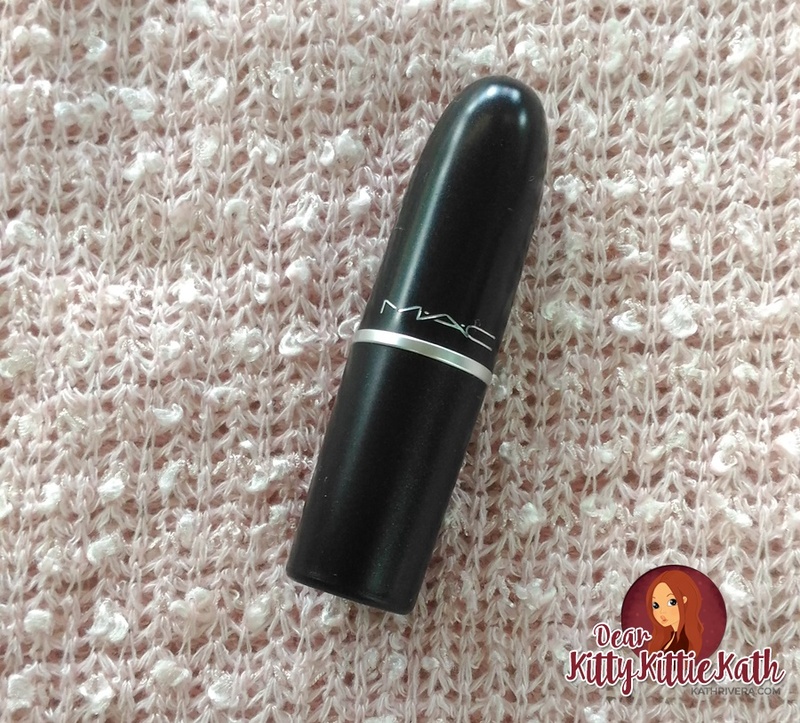 From the time I bought it (around July last year), I've used this lipstick for not more than five times. I give this a 5/5 rating. Perfect score because I've found a true red shade lipstick that doesn't make me look snob. It's expensive but if I'll do the math, a bullet will serve me a long time since I don't use it often. This red shade is perfect for formal and special occasions as I feel pretty and primp wearing it. If you plan to buy this lipstick, be sure to use a lip balm prior to application. A lip liner is also helpful in smoothing the edges of your lips so that application will be a breeze. 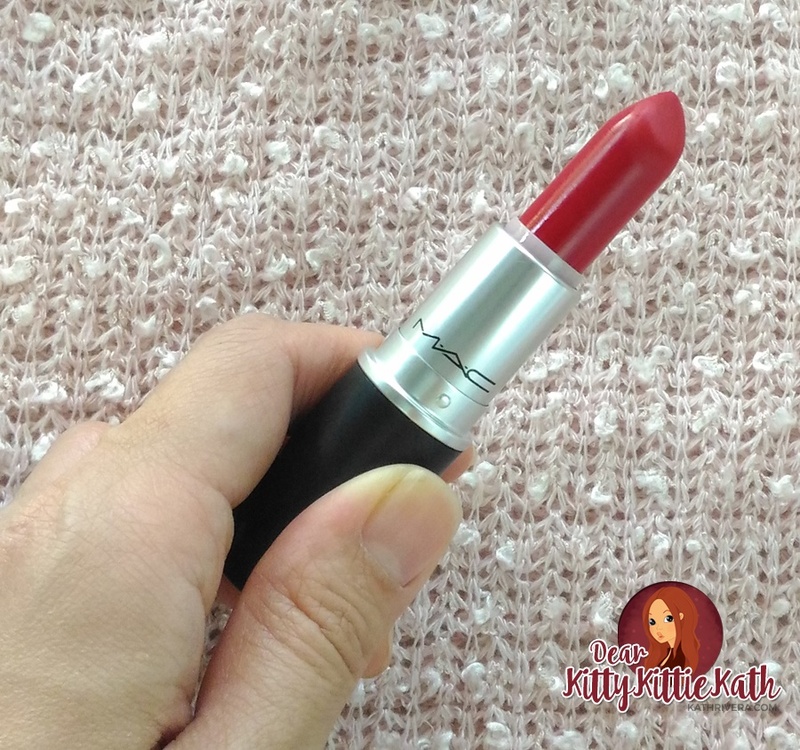 Do you have a red lipstick from MAC? What's your favorite red lipstick? hope i could purchase this lipstick too. lagi siya oos aa trinoma.The color really suits you po. Have you checked na sa lahat ng MAC stores? 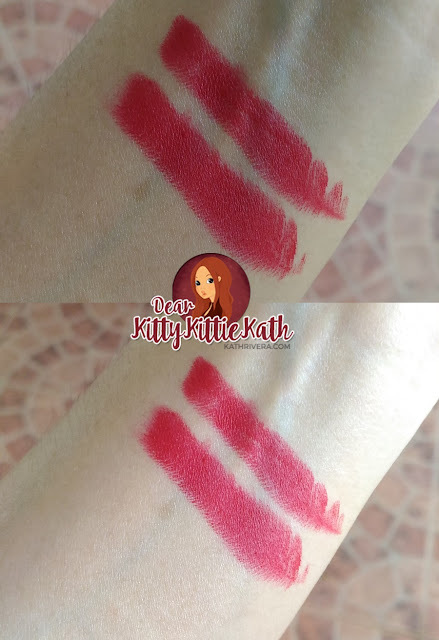 Yup, ever since sinabi ni Maine na ito yung lipstick nya naging OOS na agad. Hope makabile ka din. Thank you! That's my problem before. I veered away from red lipstick. Honestly, nilakasan ko lang loon ko to try Ruby Woo and I'm happy na it's okay naman pala with me.